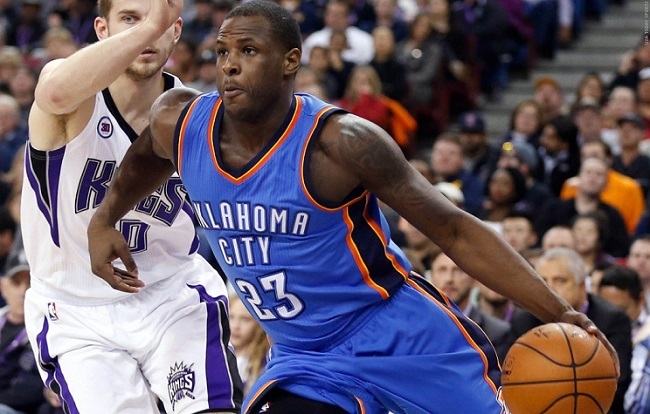 Since being traded from the Cleveland Cavaliers to the Oklahoma City Thunder on Jan. 5, Muslim American basketball pro Dion Waiters has been showing more frequent flashes of the star potential that made him the fourth overall pick in the NBA Draft three years ago. In six games with the Thunder through Tuesday’s schedule, Waiters is averaging 12.5 points and 1.7 steals while shooting 41.1 percent from the field and 31.6 percent from three-point range — all improvements from his stats with Cleveland this season — and benefitting from being given more freedom under OKC coach Scott Brooks. Of especially encouraging note is that Waiters is thriving alongside Kevin Durant and Russell Westbrook, something that couldn’t be said of his time playing with LeBron James and Kyrie Irving. The Westbrook-Waiters-Durant grouping has a +21.6 net rating — with offensive and defensive efficiencies of 111.5 and 89.9, respectively — in 64 minutes since the trade, the best number of Scott Brooks’ eight most utilized trios over that timeframe. And while a portion of that impressive mark was compiled in Sunday’s laugher versus Orlando, the eye-test supports it — Oklahoma City is playing at a breakneck pace while sharing the ball and pressuring defensively when Waiters shares the floor with its two superstars. The importance of these early returns can’t be discounted. We assumed that Waiters would be no happier playing an ancillary role with the Thunder similar to the one he did as a Cavalier, but that hasn’t been the case from multiple perspectives. Brooks has been comfortable allowing Waiters to embrace his natural basketball id as a ball-dominator, and even played the Syracuse product 31 or more minutes twice already — half as many such outings as Waiters notched in 33 contests with Cleveland. In an opinion piece on Bleacher Report, Waiters was tabbed as the NBA shooting guard most likely to have a breakout in the second half of this season. That piece cites not only Waiters’ offensive game blossoming in OKC’s more freewheeling system, but also his consistent defensive effort. Right now he’s coming off the bench behind starter Andre Roberson, a defensive stalwart in his own right, but Waiters could turn a solid two-way game into a starting role of his own if he keeps it up.